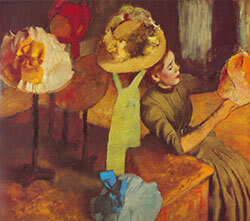 This month's featured oil painting is Degas's 'The Millinery Shop'. In this oil painting, Degas indeed rendered the Impressionists quickly changing modern world, with its unusual cropping and tilted perspective, seems to capture an unedited glimpse of the interior of a small nineteenth-century hat shop. With her mouth pursed around a pin and her hands gloved to protect the delicate fabric, a young shop girl leans back to examine her creation. She is totally absorbed in her work and, like most of the women in Degas art, seems unaware of being watched. Degas has scraped and repainted the milliners hands and her hat in progress so that both appear to be in movement, drawing an analogy between her creative efforts and those of the artist. This analogy extends to the bonnets, which are displayed on the table like a still life: where they are unfinished, so too is the painting. Xrays and preparatory drawings show that Degas originally intended what is now a plain shop girl to be an elaborately hatted customer. Thus, what began as a painting about vanity and fashion become instead a metaphor on artistic creation and consumption. The hat, for Degas, was the supreme emblem of the modern bourgeois woman. The reworking of this oil painting, with its bold pattern of colours, coincided with the slow but relentless transformation in Degas artwork during the 1880s and 1890s toward simpler compositions and more expressive use of colour. Of at least fifteen drawings, and paintings Degas created on this subject during the 1880s, The Millinery Shop is the largest and most ambitious.